Service exports continued growing in the second quarter of 2018, up by seven per cent year-on-year. Service imports also grew by seven per cent. 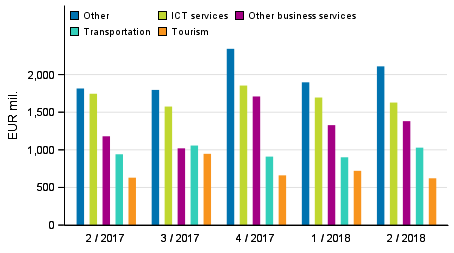 Service exports increased particularly due to the growth in exports of construction and project deliveries, transport and other business services. Sweden was the most significant country of exports for Finland in both goods and services in 2017 and in the first half of 2018. The data appear from Statistics Finland's statistics on international trade in goods and services, which are part of balance of payments. The combined exports of goods and services grew by six per cent and imports by five per cent in the second quarter of 2018 compared with the corresponding quarter in 2017. In balance of payments terms, goods exports grew by six per cent and goods imports by three per cent. Exports of both construction and project deliveries and other business services grew by around EUR 200 million in the second quarter of 2018 compared to one year ago. Exports of construction and project deliveries went up by 43 per cent and those of other business services by 17 per cent. Exports of other business services grew mostly on account of an increase of over EUR 100 million in the sub-item professional and management consulting services, which include such as legal services, accounting, auditing, bookkeeping and tax consultancy services, and advertising, market research and public opinion polling. Exports of only one service item decreased significantly. The item in question, telecommunications, computer and information services (ICT services), was nevertheless the biggest service item of exports. Exports of ICT services went down by seven per cent from the corresponding period one year earlier. Exports of ICT services thus fell by over EUR 100 million. Service imports grew by seven per cent in the second quarter of 2018. The growth in service imports was particularly due to the increase in construction and project deliveries, transport services, travel and ICT service imports. Thirty-seven per cent more construction and project deliveries were imported and 13 per cent more ICT services. 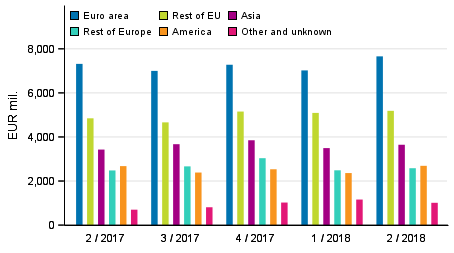 The level of travel exports (travel to Finland) did not change in the second quarter of 2018 compared to one year ago. The value of travel expenditure abroad from Finland, which is included in the statistics as travel imports, grew by 11 per cent from the year before. More travel services are imported than exported. Finland received income from travel services to the value of EUR 0.6 billion in the second quarter of 2018. Expenditure abroad from Finland amounted to EUR 1.4 billion. Finland’s trade in travel services is thus in deficit. Sweden’s share of Finland’s service exports was 14 per cent and of goods exports in balance of payments terms 12 per cent in 2017. Sweden was thus Finland’s most important country of exports in 2017. The corresponding shares of the second most important country of goods exports, Germany, were eight per cent in services and nine per cent in goods. In balance of payments, goods exports is based on change of ownership, not on border crossing. In that case, goods sent abroad for processing in Finland do not increase Finland's goods exports if the owner of the goods does not change. Goods sent abroad for processing in Finland are visible in Finland's service exports. The value of goods exported to Sweden was EUR 1.8 billion higher than to Germany in 2017. Exports of goods to Sweden went up by nine per cent and to Germany by seven per cent in 2017 compared with the previous year. In balance of payments terms, the value of goods exported to Sweden was EUR 0.9 billion higher than to Germany in January to June 2018. 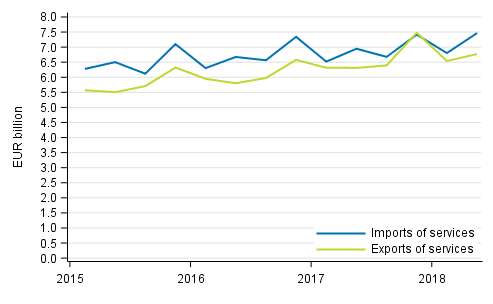 Germany did not thus overtake Sweden as concerns goods exports, although goods exports to Germany were exceptionally big in the second quarter of 2018. A single significant goods item raised goods exports to Germany. More services were also exported to Sweden than to Germany in 2017, but service exports to Germany increased by 18 per cent from 2016 to 2017. The corresponding growth figure for Sweden was seven per cent. Exports of manufacturing services to Germany grew by as much as 68 per cent, while they grew by just two per cent to Sweden in 2017 compared with the previous year. The statistics on international trade in goods and services are part of balance of payments. The statistics comprise breakdowns of goods and services on a more detailed level. The guidelines and recommendations of the Balance of Payments Manual (BPM6) applied to balance of payments are consistent with the European System of Accounts (ESA 2010). National Accounts are published on quarterly and annual levels . Finnish Customs publishes data on trade of goods across borders. Goods trade published by Finnish Customs is used as source data for the statistics on international trade in goods and services. Removals and additions caused by definitions are made to them to achieve goods trade in balance of payments terms. Finnish Customs’ statistical service, tilastot@tulli.fi, +358 29 552 335. ISSN=2343-4244. 2nd quarter 2018. Helsinki: Statistics Finland [referred: 26.4.2019].